One night last fall after our club meeting, I hitched a ride into the park with a friend John B. Since I don't have a 4wd pass to get into the park, I usually trade plugs for taxi services from my friends. As I am throwing my stuff into his truck, I hand him a few needles I had been working on tell him to pick one. He chose a nice parrot colored one that was one of my favorites of the batch. I finally get my stuff in the truck and we head into the park. Once on the sand we find a friend of ours and get a quick report, make a few casts and move onto another stretch of sand. Apparently John had been a bit of a bad streak and the very sporadic fishing in NJ wasn't helping him. We are fishing for a little while and I think we both had a couple hits and then John lands a striper. I walk over to steal his boot prints and he tells me that he caught it on the new needlefish I gave him and that it should be called the "skunk chaser". So I did what I was told. Please welcome the JBSC (John B Skunk Chaser) to the Choopy family! Now that I am making a bunch of different styles of needlefish, what seperates the JBSC from the others. It is my spin on what has traditionally known as a "blast" style needlefish. It is built to cast and zips through the air. Its not a plug to put on and cast if your spool isn't filled just about full. Its thin enough to imitate sand eels and big spearing, but has enough width to also imitate bunker, mullet herring and other miscellaneous juvenile fish that hang around inshore. Also, If you love catching bluefish, this could be the lure for you since it only has the single siwash tail hook making releasing the toothy bluefish much easier. So the next time the wind is in your face, or the fish are breaking out over the bar and you can't reach them, try the JBSC. While it usually doesn't matter, sometimes those extra 5 yards can make a difference. 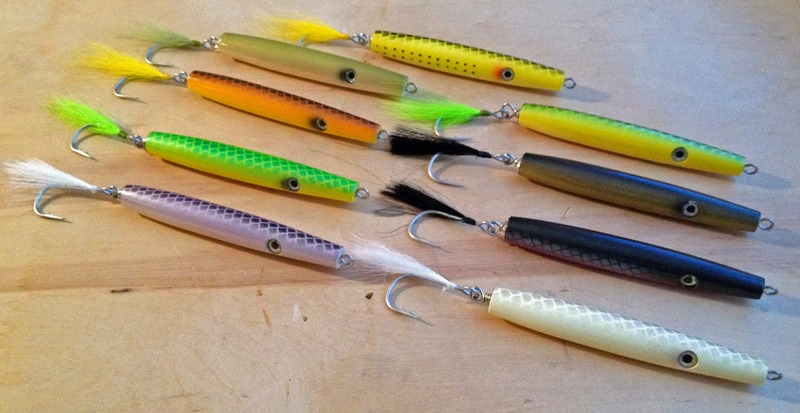 Please stop by the table at one of this winter's flea markets (listing here) and check the JBSC Needlefish out!